follow url I know this update is long overdue. We have been busy running back and forth between Madonna and work, and somehow we just couldn’t seem to get this done. Emma has settled into life here at Madonna. Her days are busy and full of therapy. http://cinziamazzamakeup.com/?x=comprare-vardenafil-senza-ricetta-Palermo While I wish I could say she was back to doing everything she could before, we just aren’t there yet. As a parent it is so hard to be patient and understand how slow progress can be at times. Emma is continuing to get a little bit better each day. Her personality and happiness have been coming back and we are so happy to see this. She is also talking more, which is great. Emma has 3 hours of therapy each day at Madonna which consist of two PT sessions, 2 OT sessions, and 2 speech sessions. She has been working hard on strengthening her core to improve her sitting and standing. Emma is now able to sit for a few seconds by herself. It isn’t much, but it is a start. 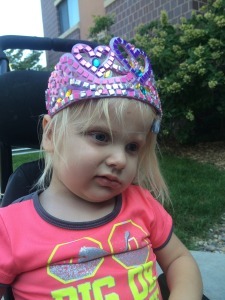 Her therapists feel she is a little scared to sit again, because it hurt so much to sit for so long before the surgery when the tubing was wrapped around her bowel. So some of her work needs to be overcoming that fear and not being a stubborn two year old. She has also been working on standing and some walking. Standing is very hard work for her, as is walking. She needs support around her waist to stand and some cues to take steps when walking. Yesterday they put her in the light gate trainer, which gives her support and allows her to take steps, but not have to bear full weight on her legs. She was able to walk about 40 feet in it, which is an improvement. At times it is frustrating to think of all she had accomplished and how much she has lost. She cries through a lot of therapy which is heartbreaking, but she is slowly progressing and that is what matters most. Emma is finally done with her steroids. She has gained 6 pounds since surgery, which seems like a lot, but the doctors said that it is ok and the weight gain should slow down now that she is off of the steroids. source url Emma has been here working hard everyday and Brent and I have been working most days. We switch back and forth driving to Lincoln at night and staying with Emma, then driving back to work. Haley has been a savior for us again, and comes each day and spends the day going to therapy with Emma so that we can continue to work each day. We hate having to be away from Emma during the day and during therapy, but unfortunately we can’t be gone from work either because we have to have health insurance. Sometimes the decisions we must make really weigh on us. Stays like this are so hard on Aiden, Emma and our family, but we know it is what is best for Emma’s progress. 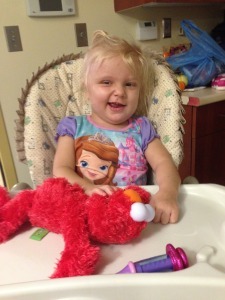 As of right now Emma’s estimated discharge date is October 3rd, which is only a week and half away. However, they are constantly assessing Emma’s progress and they could decide to extend her stay. While we are excited at the possibility of going home soon, we also want more than anything for Emma to make the most of her time here so that she makes the progress she needs. We want her to be able to come home and be able to take part in her environment and not be completely dependent on us to even sit and play. http://maientertainmentlaw.com/?search=safest-place-to-best-buy-prednisone-online Emma had her first round of her new chemo regimen yesterday. She will be receiving Vinblastin weekly for a year as long as it is working. The Vinblastin is administered as a push through her port, which means it only takes a few seconds to administer instead of hours. Things went well yesterday; however, Emma woke up with a 101 degree fever this morning. Unfortunately the fever climbed to 102. Needless to say, this made for a long day of therapy. After several pokes, blood cultures and discussion between Madonna and Children’s in Omaha they decided they don’t really know for sure what caused the fever. Emma’s blood counts looked alright, which means no infection. So we aren’t sure if she has a little bug or had a reaction to the new chemo. Unfortunately, they tried to access Emma’s port twice at Madonna today and were not able to get blood return. It worked yesterday at chemo, but wasn’t cooperating today. We are keeping our fingers crossed that it works next time, or we could be looking at another surgery for a new port. They gave Emma an antibiotic today as a precaution and will do another dose tomorrow. By this evening her fever seems to have broken, so we are hoping she is feeling better and still fever free in the morning. miglior sito per comprare viagra generico 100 mg a Parma I know we haven’t been very good at updating the last two weeks, but we continue to be overwhelmed by the prayers and support of so many. We thank each and everyone of you who continues to pray for Emma and do so much for us. Thank you to our staffs at Carriage Hill and Bellevue East who have been sending meals. We also want to say a very special thank you to the Clarkson Staff who put together the Patriots for EmmaStrong fundraiser last week. I so wish we could have been there. It sounds like it was truly amazing! We cannot thank you enough for all the work you put into this event for our family. We are truly blessed to have so many people helping us through this journey!